Halloween is coming up! It is that time of year again that you can give people a good scare and then have a laugh about it! Children love halloween for 2 different reasons, I believe. The first one is that they get to play dress-up and the second of course is candy! Now that I think about it, I'm pretty sure that grown-ups love halloween for the same reasons. Well, most of them. 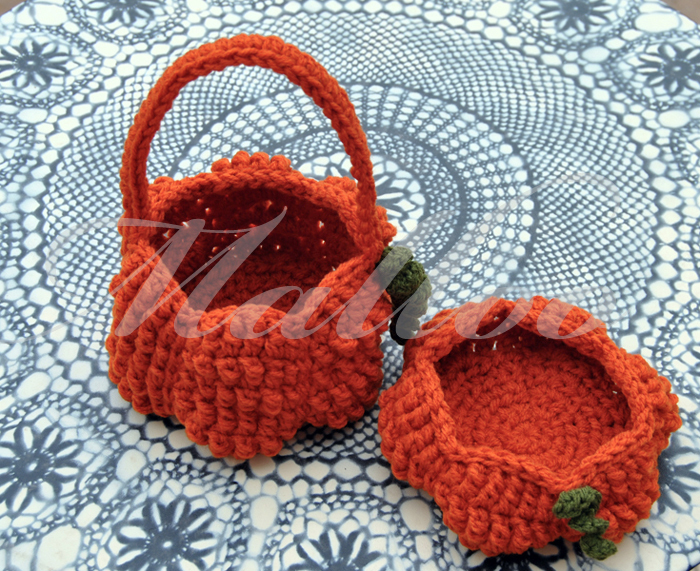 So let's make a crochet, pumpkin shaped, basket for the little ones to go on trick or treating. But even if this fine holiday is not celebrated in your country you can make a small basket to decorate your home and let the spirits come to you! 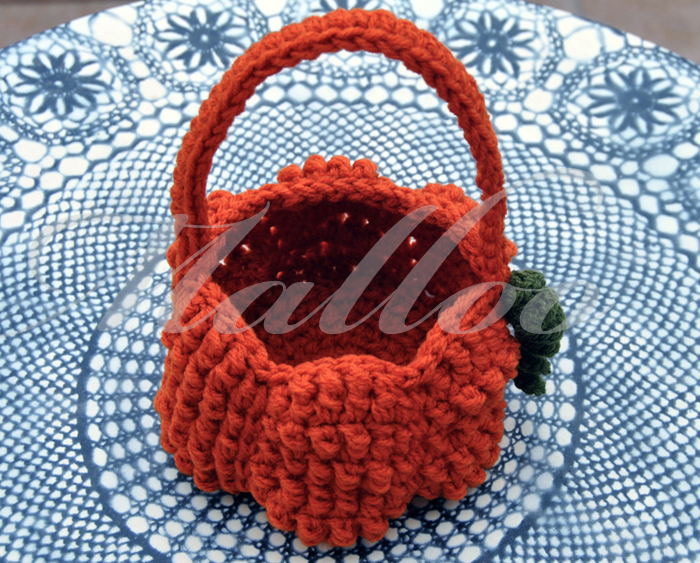 This crochet pattern was designed by Lou from Malloo Crochet Designs exclusively for My Hobby is Crochet Blog. For a nice sturdier look, we are going to hold the yarn double for the entire project. I usually prefer to have two skeins of the same color and take one strand of yarn from each, instead of one skein and use the beginning and the ending of the yarn together. It's much easier. If you would like to make the smaller version of the basket for home decoration you can stop at round 7 and make one final round just with sl st, for a polished finish! Join yarn (again held double) at the point where you finished your project, ch 35 and sl st at the opposite side of the basket, then ch 1 and sc in each ch, until you reach again the other end, make a sl st an fasten off. With the 4 mm hook and one strand of green yarn, ch 16, 4 sc in second chain from hook, 4sc in each of the next 4 chains, 4 hdc in each of the next 5 chains and 4 dc in each of the next 5 chains. Fasten off. With the 4 mm hook and one strand of green yarn, ch 8, 4 sc in second ch from hook, 4 sc in each of the next 2 chains, 4 hdc in each of the next 4 chains. Fasten off. Hi! 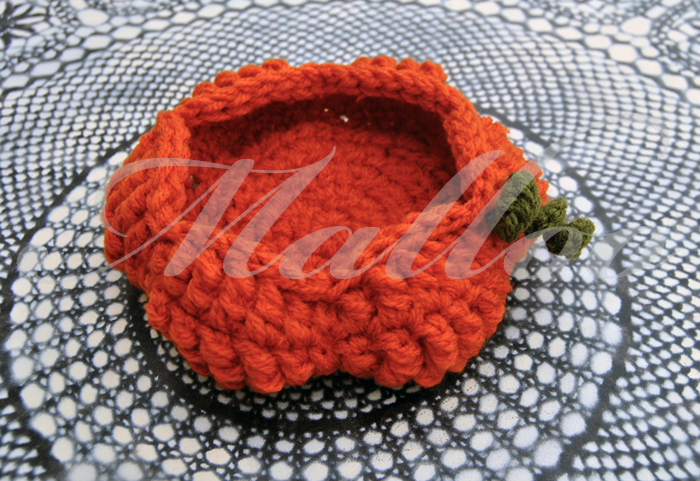 My name is Lou and I am the owner and designer behind the Etsy Shop “Malloo”. I am a crochet lover and chocolate addict. I live in beautiful Greece. I learned to crochet in 2012 and immediately began to create my own patterns. I love to play with different techniques to create texture and also trying to recreate some of my favorite knit stitches with my crochet hook! 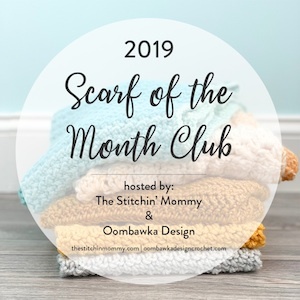 Many thanks to Lou for this sharing this pretty pattern!